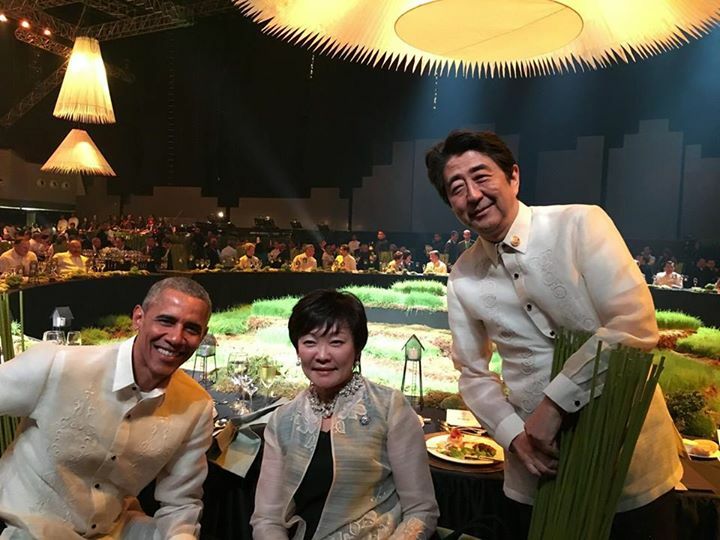 US President Barack Obama with Prime Minister Shinzo Abe and wife Akie. It's a small world after all, one might easily say. 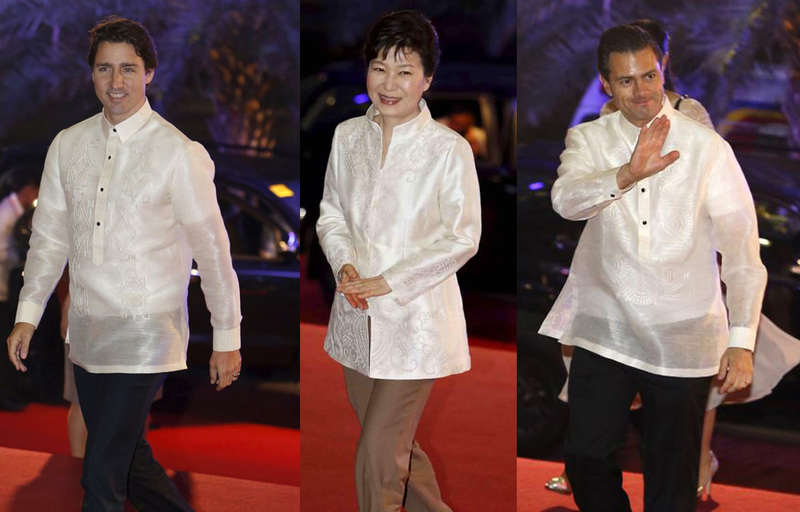 Filipino creativity and ingenuity was showcased on the world stage when leaders of the Asia-Pacific Economic Cooperation (APEC) and their spouses donned them for a formal dinner. The Barong Tagalogs worn had a different kind of shimmer to it as they were made of a unique combination of Aklan Piña and Negros Island silk. Japan's Prime Minister Shinzo Abe and his wife, Akie, displayed pride in the Philippine national dress as a commemorative photo posted on the Facebook page of the Prime Minister's Office of Japan on Thursday, showed Prime Minister Abe, and his wife smiling with US President Barack Obama, seated next to each other at the round table at the SM Mall of Asia Arena Wednesday evening. What may be unknown to Abe is that the silk which gave the fabric an elegant shimmer came from an NGO which received support Japan's Official Development Assistance. The silk from Negros Island is a product of the Silkworm Rearing Project in Bago City, less than hour south of Bacolod City on Negros Island, managed by the Organization for Industrial, Spiritual and Cultural Advancement (OISCA)-International, an NGO founded and based in Japan but extends help to developing countries mostly in Asia and the Pacific with agriculture as its main thrust. OISCA employs a holistic approach to promoting environmentally sustainable development projects in various countries including the Philippines. 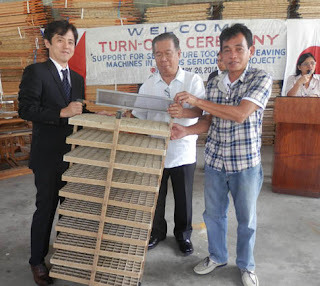 In February 2014, Japanese Embassy First Secretary Ryutaro Aoki and Negros Occidental Governor Alfredo Marañon led the ceremonial turnover of sericulture tools and equipment under the "Support for Sericulture tools and weaving machines in Negros Sericulture Project" which was held on February 26, 2014 in Bago City, Negros Occidental. The project, which was funded under the Grant Assistance for Japanese NGO Projects amounting to 2.568 million Yen (approximately 1.13 Million Pesos) to assist in the distribution of the items from Japan to the Philippines. The project involves the additional provision of 1,500 sericulture tools and three weaving machines, which will continually assist the target farmers and women's capabilities in producing silk and silk products. These tools and equipment were given by Japanese farmers and a Japanese weaving company through OISCA. Over the years, silk production in Negros has benefited and improved the lives of numerous farmers who found additional sources of livelihood from cocoon farming and later to silk products and by-products. The Bago Sericulture Center has branched out in 5 towns in Negros Occidental. The project's farmer beneficiaries produced 95% of the Philippines' total silk production. The project has also indirectly mitigated natural disasters like landslides and prevented soil erosion since formerly denuded lands became mulberry tree plantations. As a whole, the Project empowered the farmers in Negros Occidental to diversity. The successful silk industry has alleviated sole dependence on the sugar industry and provided sustainability to the communities. The Grant Assistance for Japanese NGO Projects was launched in 2002 to enhance cooperation between the Government of Japan and NGOs in the implementation of ODA to promote effective and efficient aid for developing countries. APEC Heads of Economies in Barong Tagalogs.